Are you tired about need take off the versa watch cover case while charging your versa smart watch? EZCO versa exclusive charger is available for charging with case on. But please pay attention: It can't charge while protective case off. Our EZCO item includes 1 pack Fitbit versa charging stand and 3 pack versa bumper case. --Replacement USB charger only compatible with Fitbit versa smartwatch. Available to charge with protective case on (Cannot charge when case is off). --With 3.3 feet (100cm) charging cable, can plug into the USB port onto PC, laptop, mac, notebook ect. 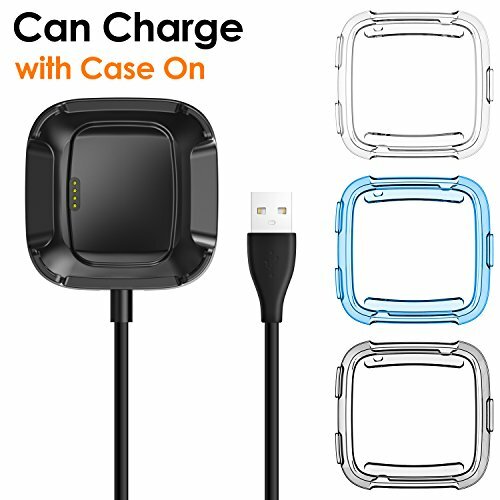 -- Don't need to remove the guard case when charging your fitbit versa with our charger cable. -- All-around Protection, protect your watch from scratch or broken. Advanced smooth, clear and transparent TPU. --With great hardness and flexibility, it is not easy to be deformed and turn yellow. If you receive a defective item or unsatisfied with this item, please feel free to contact us. EZCO covers all the cost during the replacement or refund. Our item includes one Fitbit versa charger dock and three Fitbit versa case protectors. The charger is designed to work with bumper case on. It can only charge with case on. It will not charge if you take the case off. For fitbit versa charger built-in voltage regulator to protect your fitbit versa watch from being damaged. Ensure safety using and quickly charging. Don't need to remove the bumpers when charging your versa with this charger dock. The fitbit versa charger stand becomes more convenient to charge than original charger. 3.3 feet of cable give you the flexibility you need. Versa charger dock is lightweight and compact, making it ideal to carry with you on trips or to use in the home or office, even can be adsorbed on the car phone magnetic mount for charging. EZCO promise 100% Satisfaction Guarantee. Any issue with the product, EZCO covers all the cost during the replacement or refund. If you have any questions about this product by EZCO, contact us by completing and submitting the form below. If you are looking for a specif part number, please include it with your message.